Packing Size: 64cm length. 47cm width. 25cm height. spreading to property. Please remember, you are dealing with a real fire. which may turn brown or catch fire. Protect wooden decking with a Gardeco FLOOR PROTECTION or use bricks or concrete slabs. DO NOT place your real fire under an awningÍ¾ it will burn or melt. melt or catch fire. We recommend at least one metre distance. hands with a Gardeco FIRE GLOVE. We recommend that gloves are used at all times. DO NOT allow children, especially small children, near the fire. Do not allow pets near the fire. to prevent small children coming close to the fire. simply extinguish spreading flames with earth or sand or with water immediately. DO NOT throw water on a real fire other than in an emergency. charcoal grill when not burning charcoal. completely out before leaving the real patio fire unattended. DO NOT attempt to move a real patio fire while the fire is burning. ularly if the environment is dry as in the case of a drought. this may happen after one use only. The bigger the fire, the faster the paint will burn off. cannot be prevented. It is not a product defect therefore Gardeco offer no guarantees against rusting. Corrosion may occur after one use only. Rust runs may mark flooring, slabs, and patios, so if you are worried abut marking, protect your flooring. rag or brush to that effect. scratches may appear with normal use. create a lot of smoke. The environmental friendly fuel is wood or charcoal which is carbon neutral. Forest Charcoal is made in the Wyre Forest in the UK West Midlands following to ancient rural methods. To start a fire use domestic fire lighters or balled newspaper and kindling. content pinewood from Central America, one or two sticks are enough to light a fire. 2Â½ hours. You cannot use Gardeco Fire Logs for cooking. heat, the larger the flames. Do not over-fuel the fire. Use a Gardeco POKER to reposition logs inside the patio fire. If the fire is slow to start, more air will help, use a Gardeco BELLOWS to blow air into a slow fire. of standing people and increases the draw enabling the fire to burn more efficiently. there is one in your chimenea. the chimenea once the fire is burning. This would increase the fire temperature and be a fire risk. smoke or soot. All cooking accessories MUST BE THOROUGHLY CLEANED BEFORE USE. and dust therefore must be thoroughly washed in hot water and detergent, check all dirt is removed. oil before storing. NEVER USE MINERAL OIL. accessories with water and donâ€›t coat with cooking oil rust can occur in a matter of hours. moved before oiling and storage. wood is often treated with preservatives which are toxic and can contaminate the food. embers, cook on the embers. If meat releases fat onto the hot embers which makes a flame, move the meat away from the flame. Keep a spray bottle of water handy to squirt on any flames. Used a cast iron pan to grill meat rather than placing directly on a grill. Alternatively wrap food in aluminium foil to prevent contamination. DO NOT leave meats in the sun or outside in hot weather, keep cool and covered with a clean cloth. DO NOT leave butter in the sun or uncovered. Keep meat and vegetables in separate dishes to avoid cross contamination with fluids. MAKE SURE meat is thoroughly cooked. mable surface, so the contents of the cooking accessory can be removed. DO NOT place the cooking accessory on the patio, grass, earth or directly on the ground. DO NOT put hot cooking accessories directly onto wood, furniture, plates, crockery or plastic surface. Parts of the cooking accessories in direct contact with the fire may become covered with carbon soot. Make sure you do not contaminate your food with soot. the fire, do not touch with your fingers, protect hands with Gardeco FIRE GLOVES. dling cast iron cooking accessories. DO NOT allow children to handle any of the cooking accessories. Cast iron accessories should be pre-heated for best results. Always coat the inside with oil or butter of all accessories to prevent food sticking. Butter tastes better than oil for waffles and pancakes. A small brush is useful for oiling or buttering surfaces. A flat spatula is useful to release foods from the accessory. 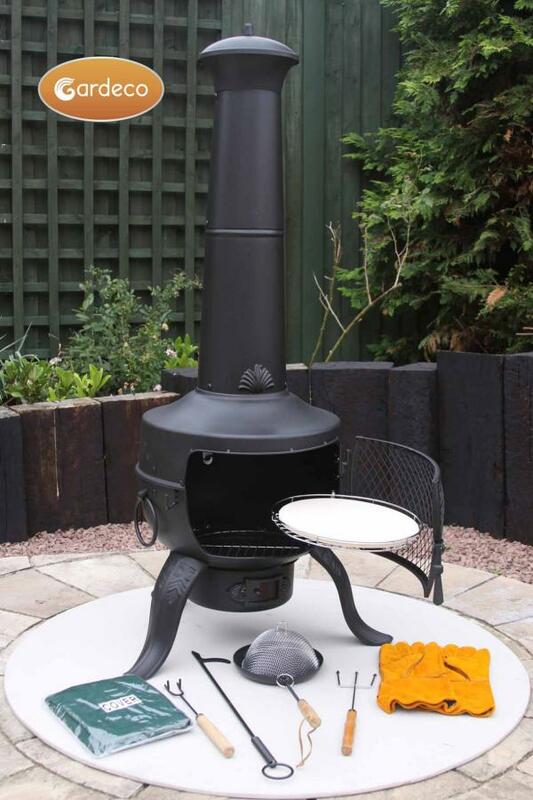 Gardeco cooking accessories are specially designed for use in chimeneas, fire bowls, barbecues or outdoor fires. which may melt in patio fires. 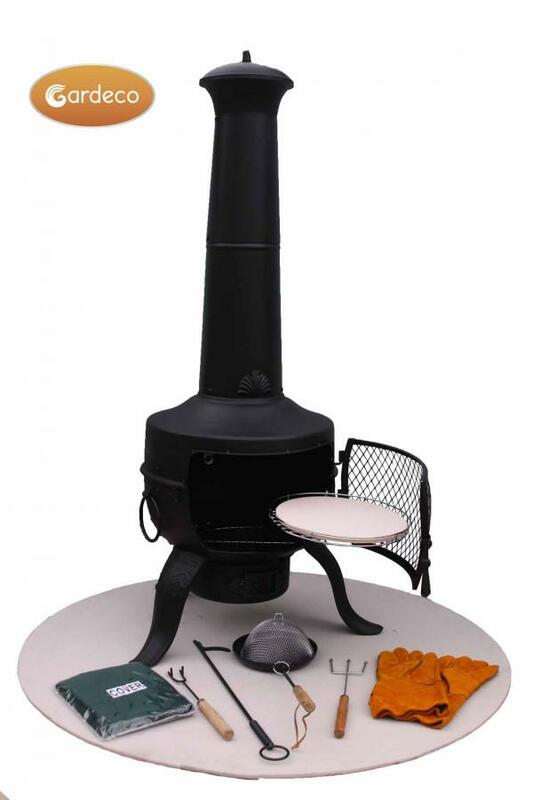 Gardeco cooking accessories are designed for cooking food on an open fire. The Gardeco COOKING IRON is perfect for burgers, sausages, vegetablesÍ¾ it is multi-purpose. The Gardeco TOASTIE IRON makes tasty sandwich toasties. The Gardeco FRYING PAN is great for steaks, bacon, frying tomatoes and fried eggs. The Gardeco POP CORN POPPER is great for entertaining children, who love watching popping corn. The Gardeco PANCAKE PAN for making pancakes. The Gardeco WAFFLE IRON for making waffles. The Gardeco TOASTING FORK makes delicious toast and marshmallows, or to warm rolls or croissants. The Gardeco PIZZA STONE is great for making pizzas the Italian way. time subsequently, even if they were put away clean. cooking instructions supplied with the packaging. even if taken out of the chimenea. Assembly is easier with two people, one to hold the parts and a second person to insert the fixings. 1) Assemble the 3 legs(G) to the bottom bowl (A) using 6 screws(S1) and 6 nuts(N1). Assemble the ash tray (J) to the bottom bowl(A) using 3 screws (S1) and 3 nuts (N1). 4) Screw the lower chimney section (C) to the top bowl (B) using 3 screws (S1) and nuts (N1). 5) Screw the upper chimney section (D) to the lower chimney (C) using 3 Screws (S1) and nuts (N1). 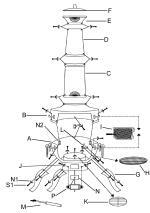 6) Screw the chimney funnel (E) to the upper chimney section (D) using 3 Screws (S1) and nuts (N1). 7) Put the lid (F) on the chimney funnel (E). Remove the lid when using the chimenea. 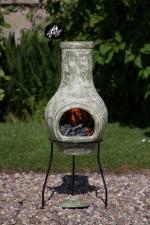 Tighten all fixings - Your chimenea is now ready to use.